Christoforos Cartoudis is presented with his British Empire Medal and is surprised by the Greek School. 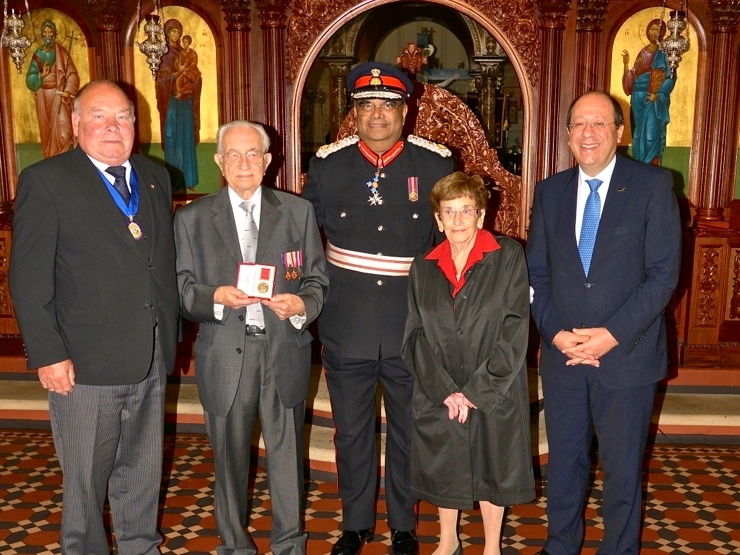 Birmingham, United Kingdom – 4th October 2014 – Chris Cartoudis, the Principal of the Greek School of Apostolos Andreas in Birmingham and Solihull resident was awarded his British Empire Medal by the Lord Lieutenant in the West Midlands Mr.Paul Sabapathy. The presentation by the Lord Lieutenant was conducted at the Greek Orthodox Cathedral in Birmingham. The venue was chosen by Chris Cartoudis so that as much of the community that he has served as its teacher could be present. After the presentation of the British Empire Medal, the Chairman of the Greek School Governing Committee announced the surprise that the school had renamed the School Hall – “The Christoforos Cartoudis Hall”. To which he invited His Excellency the High Commissioner of Cyprus Mr.Evriviades and the Chief Inspector of the Cyprus Educational Mission Mrs.Maria Papalouka to unveil the plaque. The award ceremony was attended by Lord Lieutenant, His Excellency the High Commissioner for Cyprus Mr.Euripides Evriviades, the Lord Mayor of Birmingham’s Deputy, Cllr.John Lines, the Chief Inspector of the Cypriot Educational Mission, Mrs Maria Papalouka, The Honorary Consul for Greece in Birmingham, Mr.C.Phillipides, The Honorary Consul of Cyprus in Birmingham, Costas Petrouis, the Archbishops Representative and Proistamen of the Greek Orthodox Cathedral in Birmingham, Father Kosmas Pavlidis. Other communities throughout the Midlands were represented, as well some 200 plus other guests. Most important were the Children of the School of whom some 90 children were present. Left to Right : Lord Mayor’s Deputy Cllr.John Lines, Mr.Chris Cartoudis, The Lord Lieutenant of the West Midlands Mr.Paul Sabapathy, Mrs.Areti Cartoudis, His Excellency The High Commissioner of Cyprus Mr.Euripides Evriviades.